Parenting multiples (twins, triplets, or more) is a unique, wonderful, and daunting challenge. When I first found out I was expecting twins, I was at first pretty ecstatic after having gone through struggles with infertility. Then the reality of a higher-risk twin pregnancy and the prospect of two babies hit and I was completely overwhelmed! As I do with most any new challenge I encounter, I started reading everything on the subject of twin pregnancy, twin babies, and raising twins I could find. I promise you, if there was a book about anything related to twins, I read it. So today I wanted to share the books that I found the most helpful for each stage of being a MoM (mother of multiples). 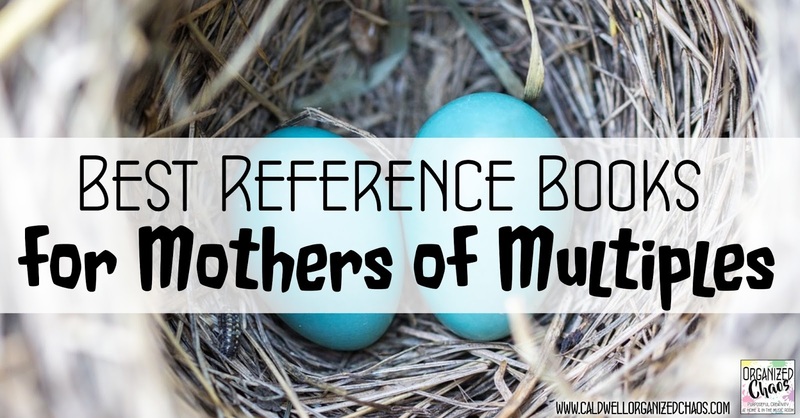 If you are expecting multiples yourself, I hope you find this list helpful! This is basically the multiple pregnancy bible. I learned so much from reading it and referred back to it over and over again throughout my pregnancy and into the first few months after the girls were born! I was blessed with an uneventful pregnancy but this book did an excellent job of preparing me for whatever may happen in a way that made me feel equipped, not paranoid. Of all the aspects of parenting babies, how they eat and how they sleep have got to be the two questions parents both struggle with most (since eating and sleeping are pretty much a baby's entire life) but also get the most opinionated about (often in very polarizing ways). If you're someone who is put off by the phrase "sleep training", don't let that stop you from reading this book. I did not follow everything that Mr. Weissbluth suggests in this book. As I think most parents do, I sort of fumbled my way through a mix of different philosophies and methods of handling my daughters' sleep. But what I think is helpful for any parent, no matter what choices you end up making in this regard, is the information on what "normal" looks like. I think this book does a great job of discussing what an average sleep pattern looks like at different ages, including a wide range of what would be considered "healthy" depending on a variety of factors. It really helped reassure me and helped me anticipate difficult transitions in their development. This is the book that I still, now that the girls are 5 years old, refer to on a regular basis. I LOVE this book. Written by a pediatrician and mother of twins, the book touches on the topics of twin pregnancy, sleep training, breastfeeding, and other important twin baby topics, but the best part of this book is her section on each stage of development up through the preschool years and beyond. For each stage of development, the book includes a description of what to expect, some of the unique challenges and distinct joys of each stage, and tips of navigating every aspect of parenting in that stage. OK, this isn't a book, but I found a lot of great advice and, most importantly, camaraderie and community through this blog for mothers of multiples. Written by a number of contributing authors, you can find posts on pretty much anything related to twins, triplets, and more you could possibly imagine. It has been a great way for me to connect with other moms going through similar experiences and look up information and advice on those random, middle of the night questions that plague me every now and then. If you are expecting multiples or know someone who is, I hope you find this information helpful. Wading through all of the information out there can be challenging when you're already overwhelmed by the prospect of multiple babies! 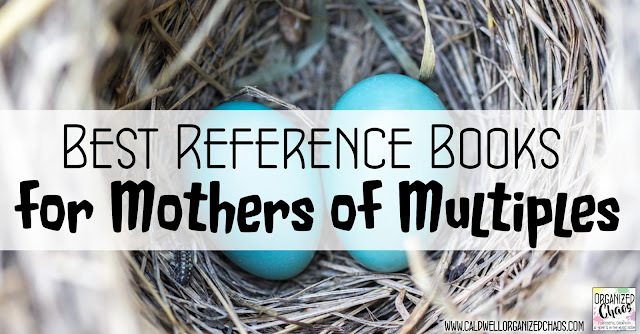 If you're a MoM yourself, what books or references have you found most helpful for you at each stage? Share them in the comments! Want more? Stay in touch by signing up for the Organized Chaos Newsletter right here and you'll get more ideas and resources sent straight to your inbox.